I had some extensive travelling past days : work trips to France and Turkey ! But now it is time to relax. It is Friday evening and here is a post of a new picture. I took this photo some weeks ago on my way back form work. 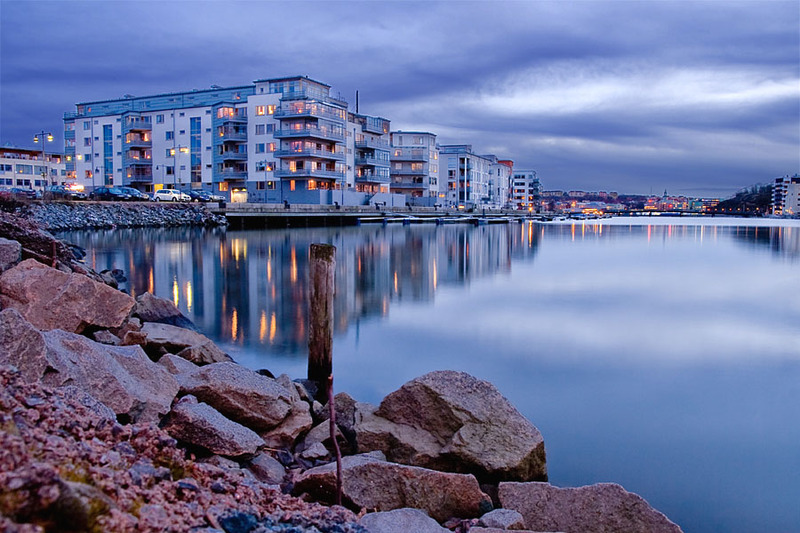 This is an old dock of Goteborg harbour in Lindholmen area. The dock surroundings were renovated during the last ten years with fancy (and expensive) buildings on the sides. Some details about the shooting : I put the camera on a GorillaPod and wrap it on the top of a rock. I put the camera in bracketting mode in order to shoot 3 photos on a row. Using bracketting on long exposures is the best that I have found in order to control the light exposure. Using the normal exposure mode of my 30D often brings pictures with dark shadows and highlight clippings around electrical light sources. Bracketting helps you to select and blend the best exposure during post treatment. Beautiful reflections. Great blue tones throughout this shot.